Please post your predictions for the game today versus the LA Clippers. The guys must do what well to get the L? Which player should Purple and Gold focus on? Will the game be up-and-down type or low-scoring? 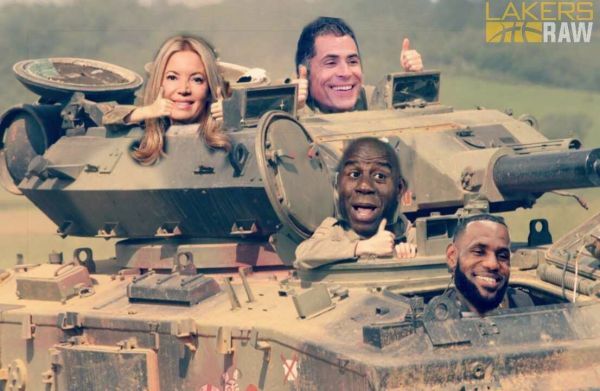 Will The Tank continue to roll on or will it hit a brick wall? The lakers “think tank” have done a wonderful job, getting half of the G-league squad to finish out the season. Lol. You got that right. Fools I tell ya. I hate these darn clippers just like I hate boston. Speaking of Boston, did anyone see the story of them tweeting out a picture of an Anthony Davis Celtic jersey?? If the league doesn’t come down on them for tampering, something is really wrong!!! Lol....Tampering only applies to the Lakers. Can’t even tank properly. Smh! Ah hell these boys came to play tonight......maybe....lol. Now that was a helluva scoop layup by JaVale. I am not watching the game but I checked on NBA.COM and it looks like the tank lost a tread. Uh oh!!!! !....tank has slowed down. Rondo was passing to you Williams....lol. Pink Panther in the house!!!!!!! Holy $hit Pink Panther on fire!!!!!! C'mon Kuz what kind of pants are you wearing on the sideline....lmao. Stop it. Caruso has a 30 piece....Hope the F.O. is taking notes. Sign Caruso now. I’m so tired of them letting talent walk. Just make a deal and get a solid player on the cheap. I don’t want to see another solid dude walk. This was a fun game to watch. I'm going to be so pissed if they being back Rondo and not Caruso. Give the "no" name's a fn chance. Not every player on the roster has to be a House hold name. I'm going to be so pissed if they being back Rondo and not Caruso. Give the "no" name's a fkn chance. Not every player on the roster has to be a House hold name. That's too easy for us to do. We have to make everything difficult. Common sense is not part of the equation. Told you this Pink Panther is something else...lol. Will they pay him? He’s gonna be in demand now. On another note some respite and cheer for laker fans after all the bashing taking place around the league and within our own fanbase as well. Lol. I sure hope so. I like Rondo but we need to move on. In all honesty I don't see why we can't retain him. He'd be a shoe in if Jerry West was running the show. But yeah this was a good feel good game tonight. This is one flucked up organization. Yes I was impressed with all the Laker bench players how they have been playing lately. It is a thing of beauty to see effort by everybody. Some get more glory then others, but I saw effort from Caruso to Muscola that had never been before. Some of these guys never get the opportunity to display their skills. Example: Muscola does have a nice three point shot, but never given the chance by the Lakers. Caruso never given the chance either, kept on the G league for two or three years. Now he is showing that he might have been a diamond on the rough and other teams are watching to what he can do. And there are others, but that is where the Lakers have lacked for the last few years since Jim Buss fired all the scouts and he decided he would decide who plays for the Lakers. Now he is gone, and I am not sure who is scouting if any for the Lakers. But it is impressive, here we have the G league players playing for the NBA Lakers, and they actually beat the Clippers who are headed to the playoffs. Actually the G league team looked better then our regular starting Laker team. I could see the hunger on these players, and were happy that Luke gave them a chance since we have all of our starters with so called injuries. Some have criticized Rondo, but Rondo really is not a bad point guard. He does make some dumb passes at times, but he is aggressive. If the Lakers do not sign Caruso as a back up to Ball, they should retain Rondo, and he does want to play for the Lakers again. Another that really has been playing good is McGee and would be a good backup center. The guy can play when healthy. Caruso did not play for the Lakers, he has been in the G league playing for coach Karl. So Luke really does not know much about what is happening in the lower leagues. He has his hands full with the regular Laker team and its young players, mixed with older players. Then what's the point of the G league team? Lol you think he hasn't called/text Luke and said you guys should take a look at "xyz" he is playing incredibly well. That's the whole point of having a coaching staff. That excuse does not wash. So it seems to me that you want Luke fired. RIGHT? Then who do you want as the next Laker coach. I want to see who you professionals think will take the Lakers to another championship, and Please don't go tell me Lue or Doc Rivers. Hell his first string players could not even beat the second string Lakers. So please don't even bring up DOC. Luke is done, regardless of what people want. It's not about a coach taking a team to the title, no coach is doing that when the NBA is a player's league. It's about eliminating as much friction as you can. It's hard enough to win in the NBA, but if you as a coach are throwing out weird lineups, have random substitutions and are sorely lacking on the tactical side and making adjustments, you're just holding the team back. No it's not all his fault, as the team build was not ideal. But there have been big question marks about Luke before LeBron even got here. His experiment to bring Randle off the bench at the beginning of last year literally did nothing. It's almost like he wanted to teach him a lesson when there was no real purpose to that move. LeBron's arrival just made Luke's weaknesses more obvious. If it were up to me, I would get rid of all 3 of Magic, Pelinka and Luke. I don't think any of them are qualified to be in their positions. But the failures of the front office don't excuse Luke's deficiencies as a coach. It's not one or the other here. It seems to me that the Lakers are firing coaches left and right just because they are not successful in their first year. Seems like they go to other places and they are successful. Just look at D'Antoni with the Rockets. They have given him a chance and he just might take the Rockets all the way this season, only team I see in the way are the Warriors, and they also have an X Laker assistant coach with Kerr in Mike Brown. He was another that was never given a chance to work a few years with what he had. About the only coach that I could see that was put into the Lakers and actually work towards a tanking season was Byron Scott. But that was the plan to tank. And I believe Luke was given a very young team and sure he got the aging LeBron, but LeBron was not going to do much with such a young team. It takes at least three years for a coach and his assistants to rebuild a team from scratch. If you think Luke could have done better, then you must be a master at rebuilding a nba team. It is real easy to point fingers from the outside. It is a lot harder when you have to get in the trenches and work with a bunch of rookies, and a few one year contract old heads to try and get them to mesh in the first year. It would be a miracle! But I am willing to listen as to some names that can be thrown into the forum here, so that we can debate what we think of your future coach. What does it matter who I think they should bring in. Luke is not doing a good job. Saying there is no one out there that can't do any better is the reason the Lakers are in this position. Trust Jeannie to persist with him or replace him with another family guy. Lol. Doc has gotten Clips into playoffs after his best player was traded. So think if he's available, they'd have to look at him. Hope they could replace the FO. Lol.